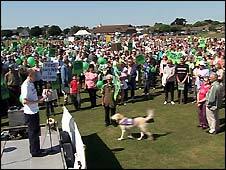 About 2,000 people have attended a protest rally against plans to build an eco-town at Ford in West Sussex. People from surrounding villages turned out to hear speeches about the plans to build 5,000 homes on the former Ford Airfield site and surrounding farmland. Protesters waved banners and posters and marched three miles along footpaths in countryside surrounding the site. 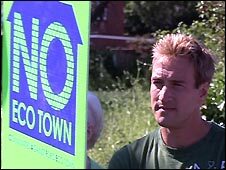 Among them was BBC presenter Ben Fogle, who attended the march with his father and Ford resident, Dr Bruce Fogle. Mr Fogle said it was "wrong" to sacrifice arable countryside for urban development. Ford is one of 15 sites in England to be shortlisted for the 10 new towns. The government announcement in April was met by a storm of protest from MPs and local people. Residents in and around Ford have claimed there will be eight years of "traffic chaos" if the proposal gets the go-ahead. They also fear the development will engulf the nearby villages of Ford, Climping and Yapton and flooding, which often occurs in the area, will be made much worse by the extra houses. The government has said that of the 5,000 homes to be built, 2,000 would be affordable. The plans would include about 4,000 jobs in new business parks, new shops, health and sports centres, and large amounts of green space. The eco-town would also help deliver the A27 Arundel bypass. Many of the protesters in Saturday's march were members of local campaign group Communities Against Ford Eco-town (CAFE), which was set up after the government announcement. They heard speeches from local MPs, Nick Gibb and Nick Herbert, while a message of support from former local resident and Olympic swimming champion Duncan Goodhew was read out in his absence. The Duchess of Norfolk, whose family seat is Arundel Castle, and Gordon Roddick, husband of the late Anita Roddick, also took part in the march. CAFE co-chairman and Yapton resident Terry Knott said: "It's not that we disagree with the concept of affordable and eco-friendly housing, far from it. "It's just that there are so many reasons why such a development should not be sited here, and virtually no arguments in favour of doing so. "Eco-towns should in theory provide affordable local housing to meet identified needs, however, there is limited demand for affordable housing in this rural part of West Sussex and restricted demand for employment in and around Ford."